Sunday afternoon Pot Roast was a tradition that my mom always made. I loved the rich flavor of the gravy over the roast and vegetables. Delicious! 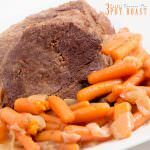 3 Packet Pot Roast, has all those yummy flavors without all the effort. It’s wonderful. 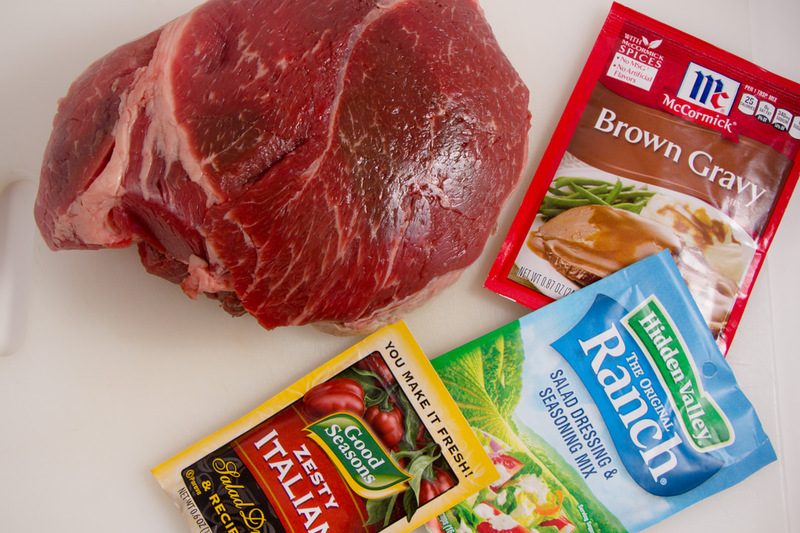 Ranch, Gravy and Zesty Italian create the perfect combination for a good traditional pot roast. You won’t believe me until you try it. The 3 Packet Pot Roast is delicious. 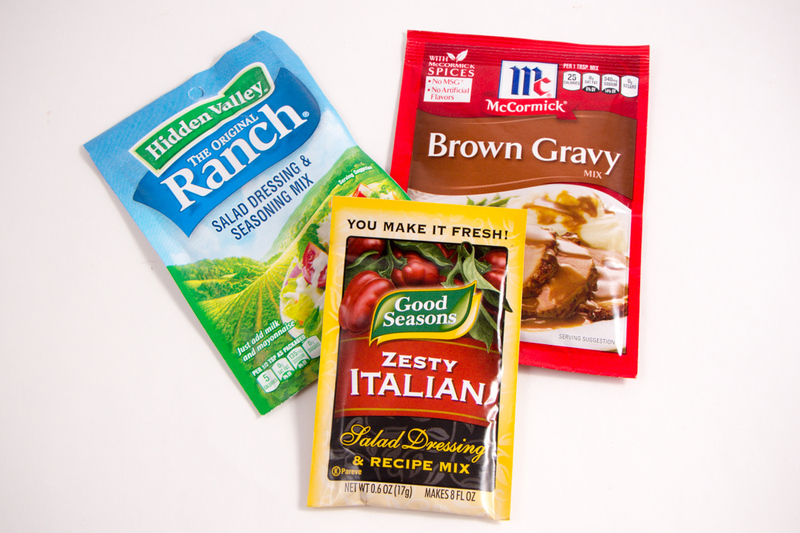 I like to mix the 3 packets (Ranch, Brown Gravy and Zesty Italian) into a small bowl and combine. It’s not necessary but I feel it helps blend the flavors before covering the roast. This recipe can also be done in a Crock Pot, by just adjusting the time. Either way you cook it will be wonderful. Place 1 cup of beef broth or water in the bottom of the pot. I prefer to use my rack to lift everything up off the bottom. However you don’t need to. Place roast that has been covered in the spice packets into the Instant Pot and place baby carrots and sliced onions on top. Don’t forget to Salt and Pepper. You don’t need a lot but it helps! I promise. Close the lid, set to manual and cook for 90 minutes for a 2-3 pound roast. Cooking Time for a Crock Pot would be 6-8 hours on low. Cooking Time for Instant Pot would be 90 minutes on manual with a 10 minute natural release and then quick release. 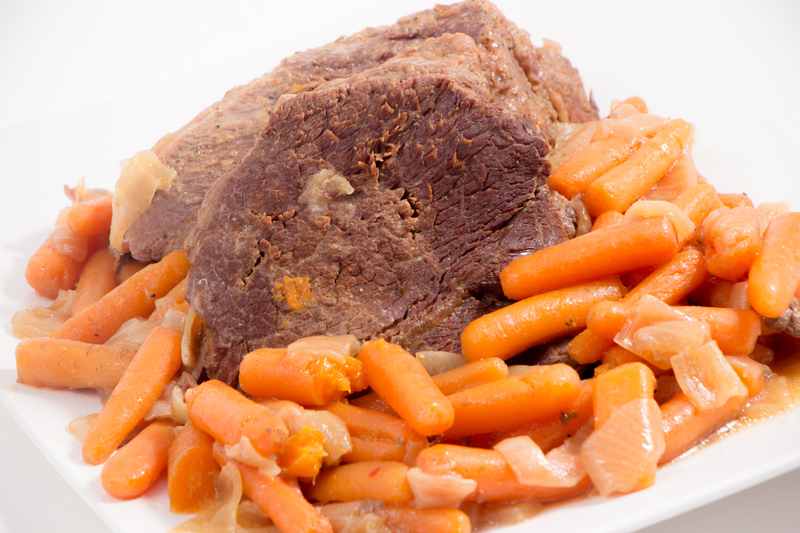 After your 3 packet pot roast has cooked, remove roast, carrots and onions from Instant Pot or Crock Pot. What’s left is some delicious juices. Pull out about 1-1 1/2 cups of this reserve juice. Add 2 Tbls Corn Starch and whisk. Heat in a sauce pan to thicken. It’s a wonderful addition to your roast. The 3 Packet of spices really add to this Pot Roast. I’m truly amazed by the combination of flavors and would never have guessed it would create such a great recipe. 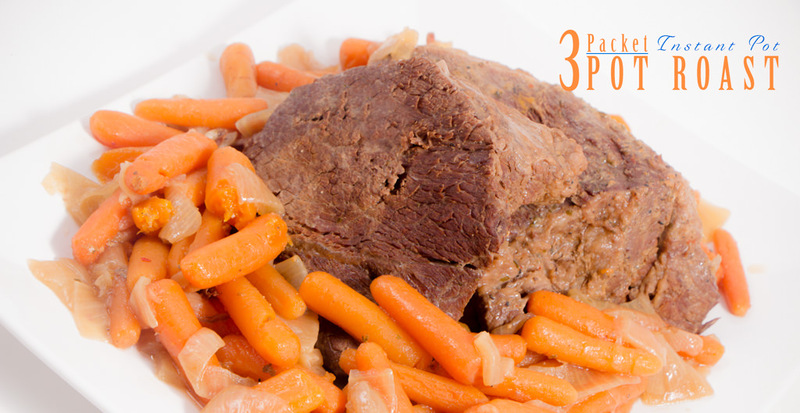 3 Packet Pot Roast is still a Sunday Favorite in our home. 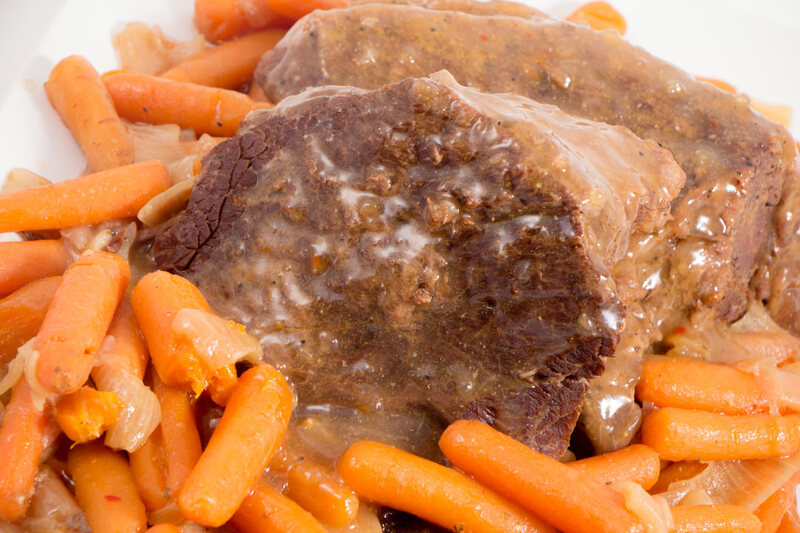 Quick and Easy, 3 Packet Pot Roast with Carrots and Onions. Mouthwatering, Delicious. Couldn't be easier! In a small bowl combine Brown Gravy, Zesty Italian, and Ranch Mix. Stir to combine. Using 2/3 of the seasoning mixture. Cover roast with seasonings. You can add Salt and Pepper if you wish! 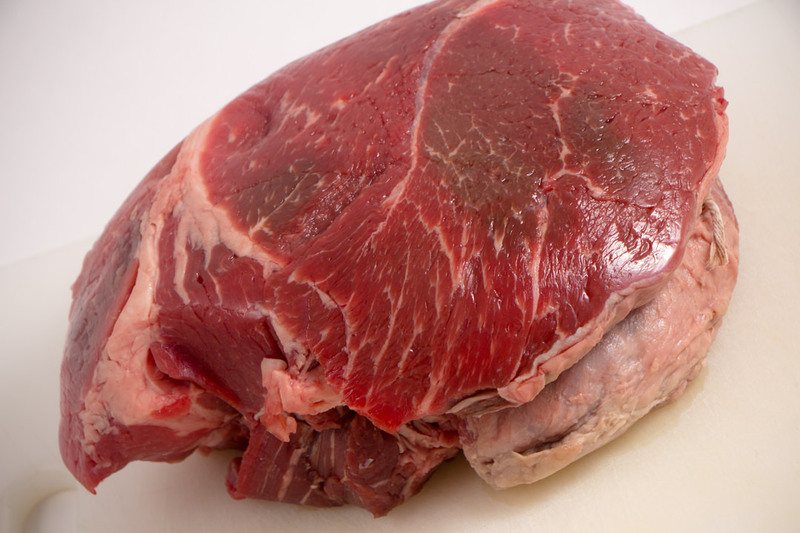 In Crock Pot or Instant Pot, pour 1 cup water or beef broth. Use a rack and place carrots and onions on top. Sprinkle remaining seasonings over Carrots and Onions. Close Instant Pot lid, make sure pressure valve is closed. Set to Manual for 90 minutes. Remove Roast and Vegetables from Instant Pot or Crock Pot. In a small saucepan add 2 Tbls Corn Starch to reserve juices and heat over medium/high heat to thicken. Use gravy over roast and vegetables. Has anyone tried to add some me potatoes to this too? Yes! I’ve added potatoes. I cube them up and add them under and around the roast. Thank you! I am excited with the redesign for sure. The gravy from this recipe is wonderful. You will love it! Finally!!! A pot roast recipe I can function with lol.. And I won’t have to spend a whole day doing it☺️☺️ I’ll be trying this this weekend in my shiny new crock pot. I agree! This recipe is perfect! So easy yet so delicious. Let us know what you think! What?? It doesn’t seem like these flavor combinations would work together. I’m going to have to try this. Thanks for the recipe! Exactly! It makes you think a little…but I promise it’s amazing when they are all combined. Yum! This is the only way I cook roast! I love eating my grandmas but this one is just different and my kids devour it! Today will be my first time doing it in the instant pot… usually just do crock pot!! Hope you tried it and enjoyed as much as my family does!! This is genius!! I would never have thought to use dressing packets in a pot roast. ‘The secret is in the sauce’ (Fried Green Tomatoes – haha) but truly, it’s crazy, but it’s a key ingredient that makes this pot roast so delicious! Awesome and your above comment anwered my question. I only own a crockpot. Any of the Instant Pot recipes can be made in the Crock Pot, Just adjust the time! We like pot roast, at least once a month in rotation menu. The left over from this is endless, sandwich, pasta, pizza. Love this recipe with only few ingredients, but delicious meal for whole family. Yes! Potroast is great and the leftovers are wonderful for sure. It’s a great recipe with wonderful flavors. This can be made in the Crock pot or the Instant Pot too!